Anthracnose is now cited as the second most serious risk to turf health in the STRI survey of turf diseases, after Microdochium Patch. Syngenta Technical Manager, Glenn Kirby, reviews the latest research as an insight to achieve more effective control this summer. The severity of Anthracnose disease attack has increased significantly over the past 10 years. Increasing periods of prolonged hot, dry summer weather, interspersed with humid thunderstorms, are more likely to trigger outbreaks. Anthracnose is one of the most difficult turf diseases to control, and its spread of infection can be very quick. The damage can be extensive and cause serious loss in surface quality – including smoothness and turf cover. New research has highlighted the importance of techniques to improve plant health and its ability to withstand disease attacks. Research shows a direct relation of higher temperatures and period of time the leaf remains wet for outbreaks of Anthracnose. High humidity, heavy dews and rainfall can all contribute to this. Results highlighted when average daily temperatures hit over 22°C, having wet leaves for just five or six hours could be sufficient to trigger the appearance of Anthracnose lesions. The curve of Anthracnose Severity Index clearly indicated that as temperatures cool, down to 20°C average for the day, longer periods of wet leaf could still initiate disease symptoms. The study also showed that the combination of temperature and leaf wetness that generated the highest correlation for outbreaks of lesions appeared between 22 and 25°C and six to 12 hours of leaf wetness. At an average temperature below 20°C – when humidity would be inherently lower – no lesions appeared, even in periods of extended leaf wetness. The apparent increasing incidence of summer storms in the UK, with periods of intense rainfall and high temperatures, would appear to be highly conducive to Anthracnose development. However, whist the high humidity climatic conditions that will enable Anthracnose to develop are well defined, whether it will infect plants and develop into damaging lesions appears to be closely related to increased plant stress. And that stress could be for any one, or combination of reasons. Strong, healthy plant growth is naturally relatively resilient to Anthracnose infection. The problem lies in that many of the management practices that are necessary to deliver the surfaces and green speed expectations demanded by today’s players are inherently stressful on turf. Top of the list is low cutting height. Research in the US showed that reducing a green’s HOC, from 3.6mm to 2.8mm, resulted in 50% increase in the incidence of Anthracnose occurring through August to mid-September (Table 1). Reducing the photosynthetically active leaf length by 25% immediately limits the plant’s ability resist attack and repair damage. Along with that, is an associated decline in supported root mass over the summer - from natural cycle of root mass die back or pest and nematode feeding damage - which consequently restricts the potential uptake of both moisture and nutrients, which are both factors that could further stress the plants. Nutrient stress has been widely acknowledged as a serious pre-cursor to Anthracnose outbreaks. The trend to reductions in nutritional inputs may have made turf plants more susceptible to disease. 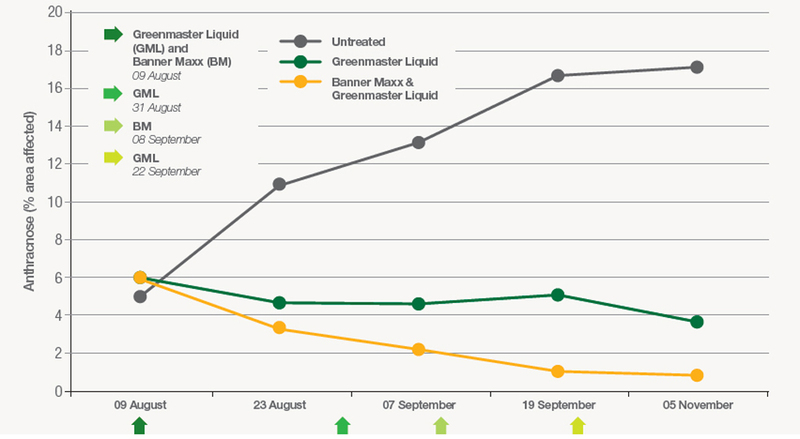 STRI trials have shown that applying a fast uptake liquid fertiliser (ICL Greenmaster Liquid) through the high-risk late summer and early autumn conditions reduced the incidence of Anthracnose by 70% - measured as a % of area infected (Fig 1). Any measures to alleviate these major stress factors will assuredly help. Alternating rolling and mowing, for example, has resulted in significant reductions in Anthracnose damage in trials, and could possibly deliver acceptable quality and speed, without taking cutting heights lower. A PGR programme will reduce frequency and leaf removal, and has been shown to support greater root retention through the summer. New pigment technology could help to protect leaves from damaging excessive UV sunlight. There has been mixed research on the effect of verticutting on Anthracnose. It is an operation that can be over used in the stress periods, in an effort to ‘true-up’ uneven growth and remove seed heads. Light verticut operations when the plant is in a healthy condition should not cause problems, but getting too aggressive with modern verticut units and damaging the crown of the plant will enhance plant stress and increase opportunity for infection. In a real-life scenario the essential point is to recognise the degree of stress being imposed on the turf and, assessing when there is a potential tipping point and taking necessary action to protect turf plants. In the STRI Anthracnose trials, when the nutrition input was used in conjunction with a fast acting systemic fungicide (Banner Maxx II), there was a further 25% reduction in the infected area at the end of the trial programme. The result was less than 1% of the surface affected, compared to over 17% of the untreated area infected, and 60% loss in the visual merit compared to the combined nutrient + fungicide treatment (Fig 2). One of the further challenges is that Anthracnose spores and infection will sit latent in the leaf, thatch and basal parts of turf plants for long periods with no ill effects – until the plant is stressed and conducive conditions occur, when outbreaks can rapidly develop. Studies have shown that Anthracnose lesions can appear on the leaf surface within hours of heat and humidity trigger points – highlighting the need for preventative action. Furthermore, when infection is already in the leaf, but before symptoms are visible, the key is to use systemic fungicide actives that can target mycelium in the leaf, as well as protecting the surface from new spore germination and infection. Pin pointing the exact time of infection is very difficult, although prediction models are improving all the time. Because course managers do not know when the initial infections occur, they often end up controlling anthracnose on a curative basis, after the fungus has already caused internal damage and further exacerbated the stress process. Recording of historic disease outbreaks is an essential first step, to identify both when and where infection is likely to occur and where attention can be focussed to reduce risks. 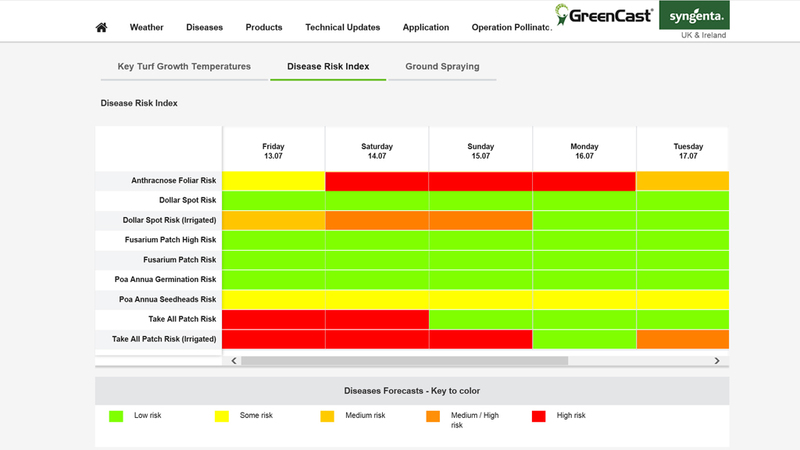 Allied to that, on-line records of disease risks can help to better identify the timing of potential problems, and indicate when mitigation and fungicide programmes can be most effectively utilised. Rather than routine prophylactic treatments, with a better picture of disease risks course managers can develop a proactive preventative approach.